Last year I wrote an article about the stage manipulator Deveen. At the time it was the best overview I could manage with the limited information I could find. Since then I have been contacted by a few people who have added a great deal to the story of Deveen, most notably one of Deveen's past assistants; Barbara Barham. Given the volume of the new information gathered, including two wonderful photos from The Davenport Collection and a few recent acquisitions, I felt it made more sense to rewrite the article rather than attempt to update it. So here follows Deveen’s story, starting with his career, then information on his act, and finally some notes on his publications. Magicians' acts can become dated with time, but few more than Deveen's. Deveen had a successful and long career on stage and occasionally on screen. His stage act remained similar throughout most of his career, generally billed as "Deveen and his Two New York Blondes". The first concrete record of Deveen as a performer I've been able to find appears in The Era in January 1925. He's listed as appearing at a ladies' night at Will Goldston's Magician Club with an act billed as "The Smoker's Dream". With this act Deveen appeared throughout variety halls, quickly gaining a strong reputation as a slick manipulator. 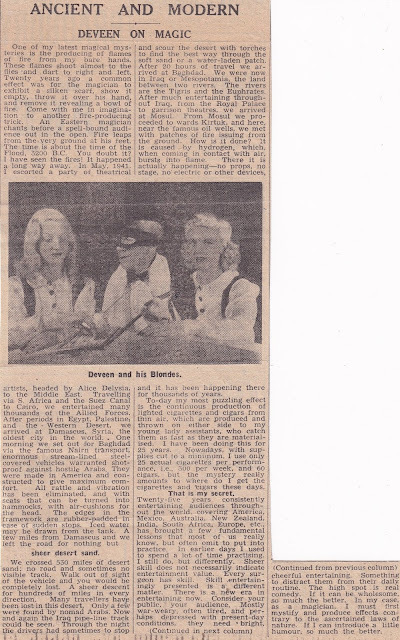 Peter Warlock reminisced in a 1986 editorial that Deveen started performing in early 1923 under his real name, A. W. Parsons, though there is no record of an A. W. Parsons performing magic at this time in the British Newspaper Archive. 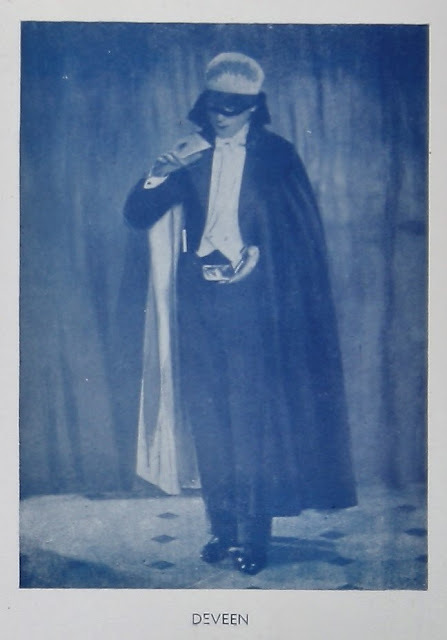 Warlock states that Parsons adopted the stage name Desmond Deveen in December 1924, which explains why January 1925 is the start point for Deveen’s name appearing in theatrical listings. I think all of these statements from Warlock should be taken with a pinch of salt, particularly as Deveen used the first name David, or nickname Dev; with no other mentions of Desmond in my research. His specialism was cigarette manipulation and his reputation in this field rapidly rose with him becoming a popular act across the UK. 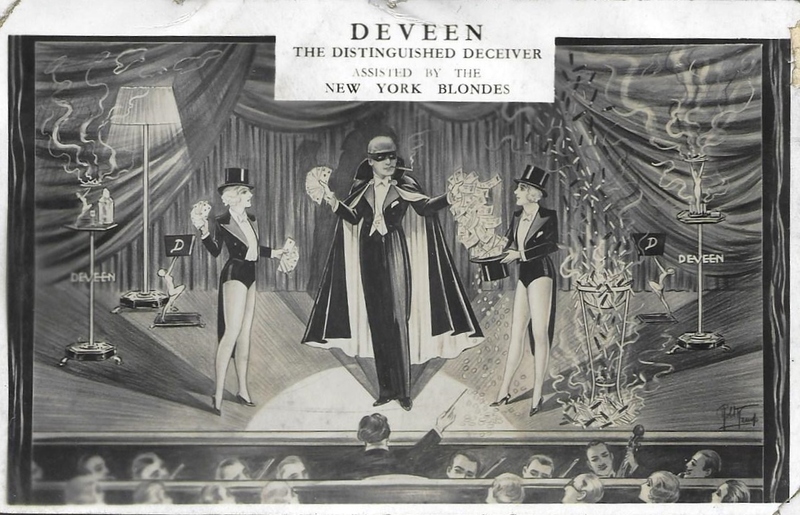 Deveen used the draw of his "New York" or sometimes "American" blondes for most of his career. Objectifying female assistants in this way is just one of the factors which dates Deveen's act, sadly it is still done by many backward looking magicians working today. Of course the assistants were probably never from America. Deveen sometimes adopted the name Devil Deveen in the late 1920s, but he shortened this back to Deveen or D. Deveen in the early 1930s. Moving into the 1930s we join Deveen in 1934, performing in Liverpool. In this case Deveen is far from the most problematic act on the bill. This poster is the earliest item I have relating to a Deveen performance and comes a few weeks before he appeared as the cover star of Gamages' house magazine, The Magician. In 1935 there’s a possible clue to where Deveen may have called home. Goldston mentions in his Magical Quarterly Magazine that Deveen is Vice-President of Leicester Magic Circle, so it is likely that Leicester was where he lived when not on the road. It’s also a rare glimpse of Deveen being involved socially with other magicians outside of IBM convention performances. One such IBM appearance was the 6th convention of the British Ring, held in Northampton in 1936. John Davenport kindly found and scanned this photograph from The Davenport Collection. Taken at the convention, it shows Deveen with two of his assistants to the left and Eric Williams on the right. Deveen’s career seems to have continued from strength to strength through the 1930s climaxing in June 1939 with him boarding the S. S. Normandie for New York. On the occasion Deveen took out an advert in The Era with his portrait alongside a boastful thank you to bookers and agents for nine years of unbroken engagements. He also says he will return to the UK with a new act, “World’s Fair, New York Programme”. It’s interesting to note that Deveen was already calling his assistants “New York Blondes” before he travelled there. The trip was not an adventurous solo venture for fame and fortune as his Era advert implied though, in reality he travelled to the USA with a cohort of magicians. 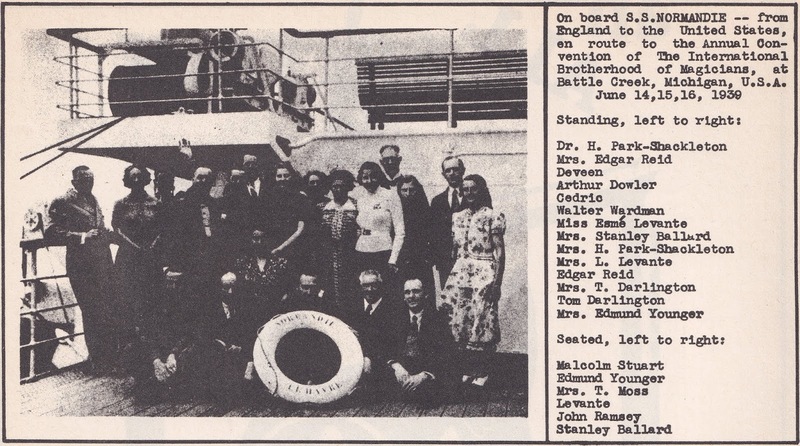 This group was travelling to Michigan for an IBM convention and included Levante, Esme Levante, John Ramsey and Arthur Dowler, among many others. The visit was documented by Annemann in the 1939 Summer Special of The Jinx alongside this picture of the group. Deveen is waving, standing third from the left. It was quite an undertaking to travel to America by boat and required five days at sea. The SS Normandie was a grand up-to-date ship which held the record for crossing the Atlantic. When they arrived in Michigan, another day’s travel from New York, they were warmly received by the American IBM. In fact they presented the group with this cup to commemorate their visit. The cup was donated by Amos Coke Cecil, a prominent amateur magician in the IBM, who also gave out an annual cup to the performer of the best trick in each convention. The convention ran from the 14th to the 16th of June. On the 19th of June the group performed to a huge crowd of 1800 people at York Community High School in Elmhurst, Illinois. This was Harlan Tarbell’s home town and he invited the group to perform there. This was reportedly the only performance the contingent did together in America apart from at the conference. On this occasion they were presented with another cup, by their host Harlan Tarbell. 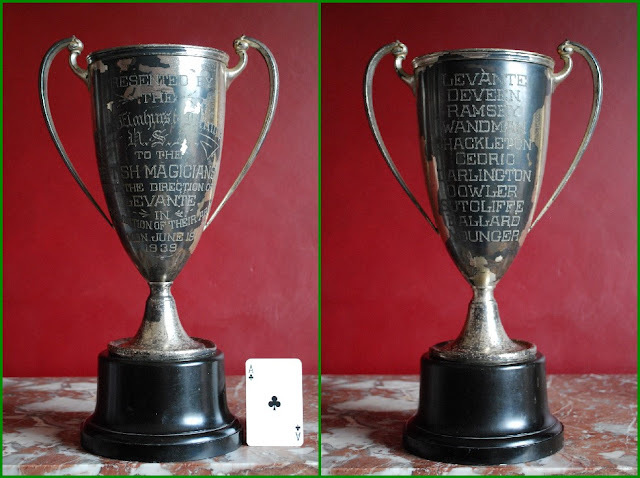 These cups returned to the UK with Walter Wandman. He kept them until he sold his business, along with these cups, to Colin John who kindly sold them to me. The American magazine The Sphinx included a lively article describing the “All British” show put on at the convention. Throughout the shows and on the cups above much is made of the fact the group were all British, but it should be remembered that the lead member of this group, Levante, was an Australian. Accompanying the article was a collage of photographs from the convention. Of particular note in the collage is Deveen, numbered 3, and Percy Abbott presenting the Coke Cecil Cup to Levante, numbered 17. For a full list of who’s in the image see the key below. 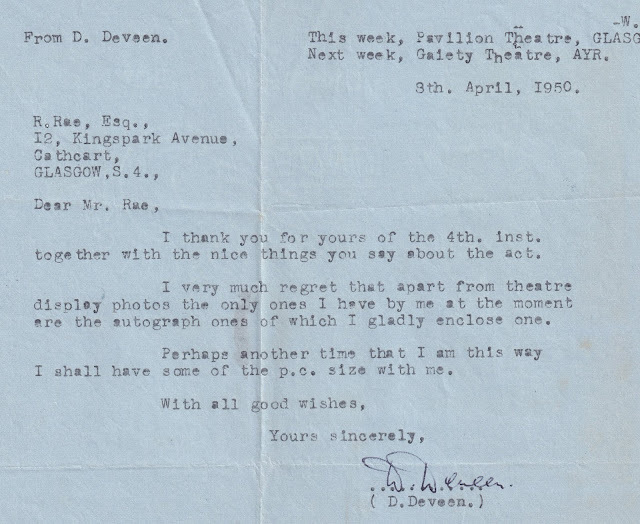 Sadly the rest of 1939 did not go as Deveen had planned. 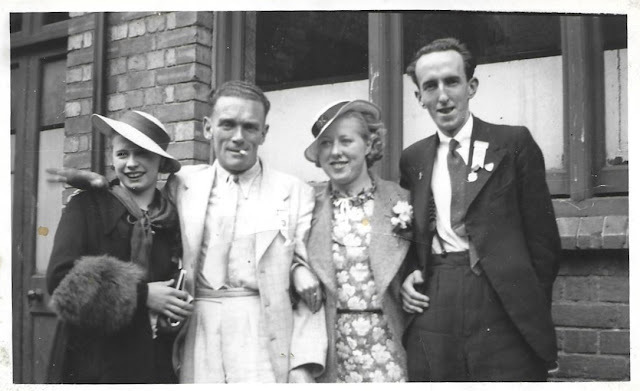 It’s unclear how long he stayed in America but the outbreak of the Second World War, within two months of his departure across the pond, was possibly the reason for his return to Britain. Alternatively he may have just travelled over for the convention and returned fairly quickly, though he did employ an agent in the USA for this trip so it does seem he planned to stay for some time. Interestingly the SS Normandie itself was taken by the US army in New York immediately when war broke out and capsized while still in service in 1942. Goldston’s Magical Quarterly gives us a few insights into Deveen’s war, thank you to James Green for directing me to these. Goldston reports in December 1939 that Deveen was already in France serving in ENSA. ENSA, the Entertainments National Service Association, had recently been founded to provide entertainment to British armed forces during the war. In September 1940 Goldston writes that Deveen is managing the Garrison Theatre Variety Company “D” and his act included items from his American tour. This does imply Deveen’s pre-war trip to America was a tour, though this may have been exaggerated to or by Goldston to boost Deveen’s image. Deveen seems to have remained in ENSA performing oversees for the whole war. In June 1944’s issue of The Magic Wand Frederic Culpitt reports that Deveen has returned to England after three years touring the Middle East. During this marathon Deveen stayed in Algiers, Tripoli, Cairo, Western Desert, Damascus, Baghdad, The Persian Gulf and Teheran. Presumably he remained in ENSA until the war ended in September 1945. For more details of Deveen’s war some appear in this article written shortly after the war, sadly I received this as a clipping so don’t know the date or publication it came from. This article also adds New Zealand, Australia, Mexico, India and South Africa to the countries Deveen had performed. After the drama of the war Deveen returned to touring the UK, though the thriving variety scene he left in 1939 was now in a slow decline. 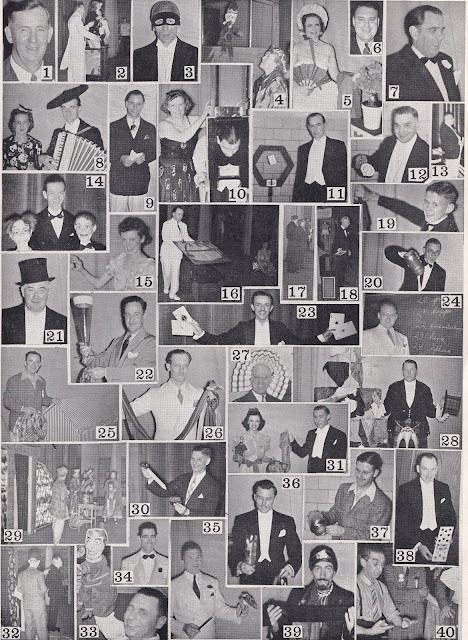 Deveen continued to perform for the IBM and reused his pre-war publicity shot (below) in a programme for the British Ring's conference of 1948, held in Bournemouth. When looking through variety programmes from the late 1940s and into the 1950s Deveen’s name appears regularly. He performed on television at least four times in the late 1940s after which his assistants were often billed as his "Television Blondes". Below is a typical billing for Deveen from this period, though a rare example of his name being featured on the cover of a programme. 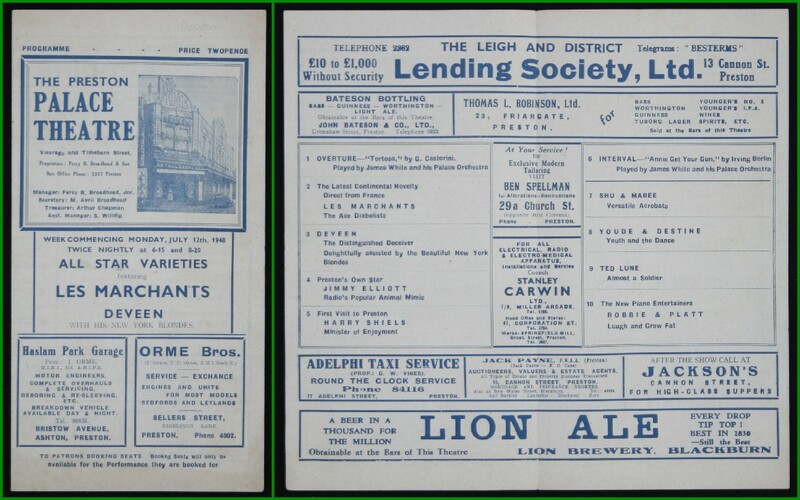 This 1948 programme from Preston's Palace Theatre illustrates the smaller, declining theatres Deveen occupied during his post-war career. 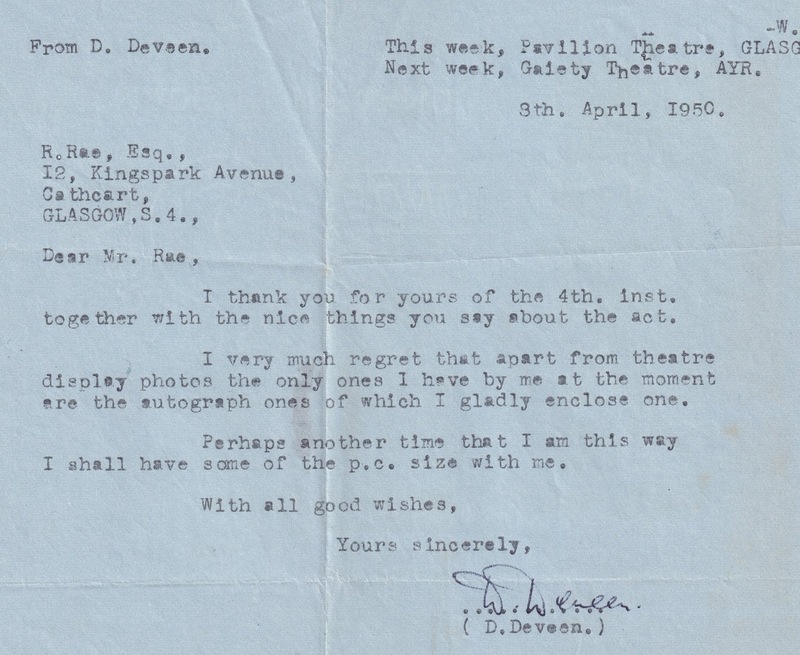 A small note sent by Deveen in April 1950 also gives a snapshot from this time. Here he’s replying to a request for a postcard from a fan. He lists his addresses as The Pavilion Theatre in Glasgow this week and The Gaiety in Ayr next week. Both these theatres were under the same management, so it is likely he toured all the Scottish theatres in this group in this run. In 1954 he shared the bill with many greats of the time at the IBM conference in Brighton. It’s interesting to note he’s sharing the bill with Levante, an IBM favourite, who Deveen travelled across the Atlantic with in 1939. This is the last IBM conference Deveen performed at, though he may have continued to attend them to see his fellow magicians. As the variety theatres closed, or converted to cinemas, Deveen continued to find work. He seems to have moved into holiday resorts, sometimes working with his wife Ivy. In 1968 they were running games for children at a Butlin's camp in Cliftonville billed as Uncle David and Auntie Ivy (the programme for this can be found in Peter Lane's article here). In some ways this seems a sad decline for the successful stage magician of his earlier years. On the other hand he was still in work beyond the closure of the variety theatres and he still performed magic. There is a record of him employed as a magician for the summer season of a small holiday camp near Filey in 1971. Between 1971 and his death in 1989 I haven't found any sign of him performing, hopefully he enjoyed a good retirement. Early in his career he was billed at the "Gay Deceiver", then later the "Distinguished Deceiver" or occasionally the "Debonair Deceiver". This was almost always followed with some variant of "...and his [two] New York Blondes. When I wrote the initial article on Deveen I couldn’t find the names of any of his assistants. Luckily one of Deveen’s assistants, Barbara Barham, read the article and got in touch. She assisted Deveen at the end of his music hall career from 1953 when she was only seventeen. Barbara, then Barbara Wells, assisted Deveen with another woman, Ivy Banks, who went on to marry Deveen in 1957. Thank you to Barbara’s husband Pete for researching Ivy’s surname and wedding. Unusually, Deveen used masks and blindfolds when on stage. 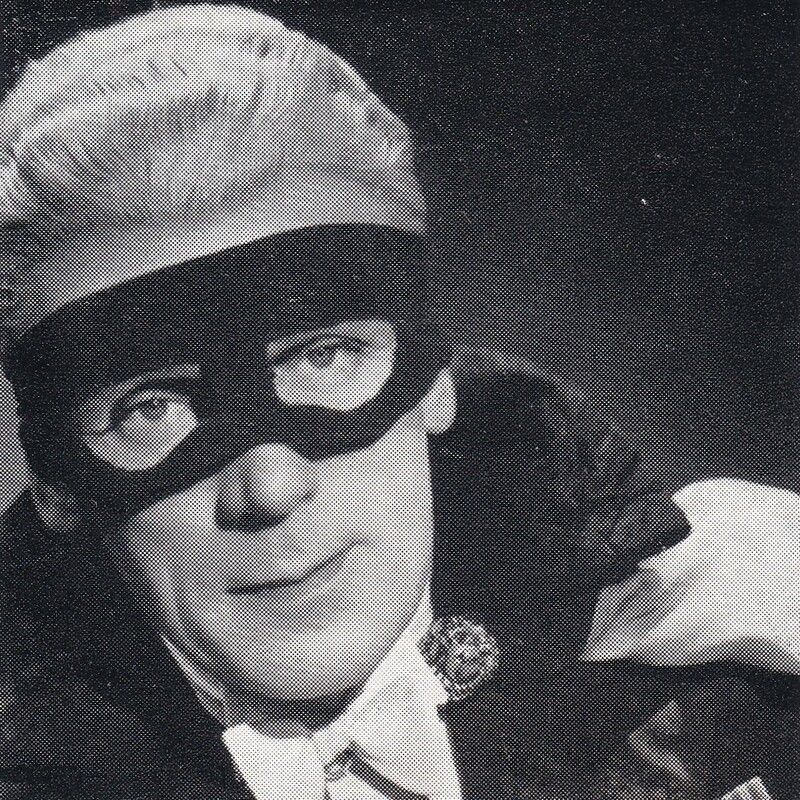 Initially he used a quite sinister peaked blindfold (above) and later an open eyed mask in the style of Zorro's mask (as above, c.1953). The smoke, cape and mask would probably have made his act more dramatic than most of his contemporary manipulators. “Dev was in 'real life' an unremarkable man to look at, but when he was dressed on stage he looked magnificent. He wore a silver wig and the mask, his floor length cloak was full and silk lined. As the music started and the tabs opened at the front of the stage he would come from the centre at a sharp confident pace, his cloak flowing. Ivy and I, dressed in black and white, coming in from left and right of stage to meet up with him and he would go into his routine. I haven’t yet found a photograph of Deveen in performance, but John Davenport has found this postcard in The Davenport Collection illustrating Deveen and two assistants mid performance. Here he’s producing a large quantity of money, a part of his act mentioned in some reviews prior to the outbreak of the Second World War. 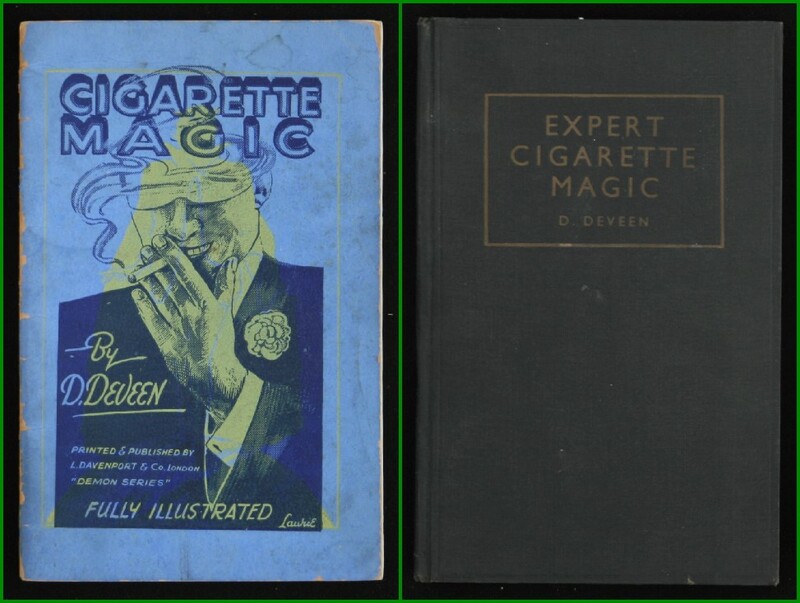 Deveen didn't keep his cigarette manipulation secrets to himself, he contributed cigarette effects to magic magazines, including The Jinx and The Sphinx during his American visit. He also published two books on cigarette manipulation. 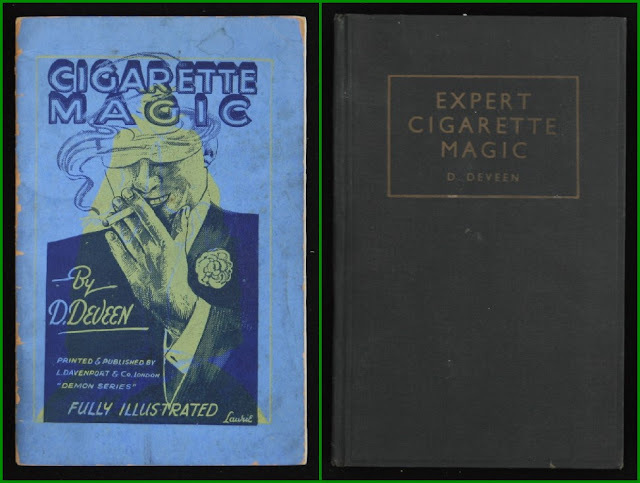 The first, "Cigarette Magic", was published in 1929 by Davenports. It was hugely popular for many years and reprinted multiple times. 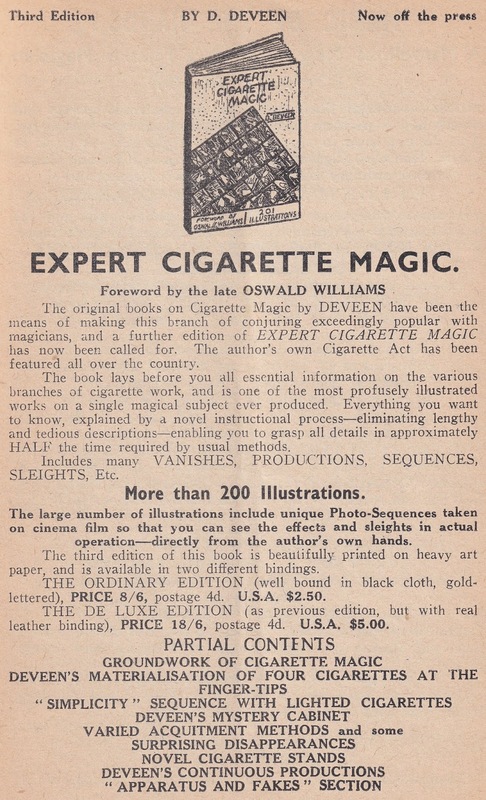 "Cigarette Magic" was followed in 1932 by "Expert Cigarette Magic", published by Edward Bagshawe. Unlike the earlier line drawings of the Davenports publication, this was photographically illustrated with dozens of pictures of Deveen performing his sleights. Here’s an advert from a 1939 Davenports catalogue showing its continuing popularity seven years on. This doesn't appear to have sold as many as the earlier publication however, probably due to the higher price such a well printed book would have been. 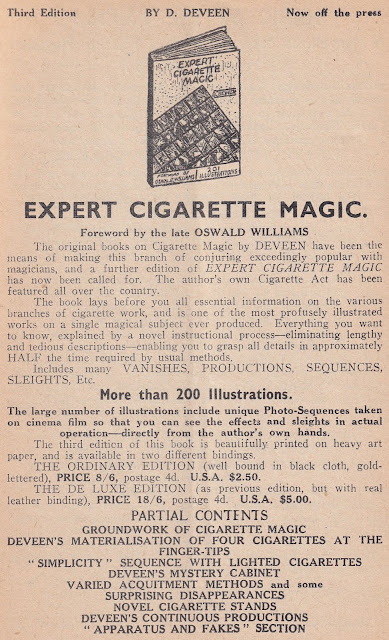 It’s still a remarkable book though, which would continue to be much used if cigarette manipulation had not declined. There is much crossover in the two books and a photographically illustrated version of the earlier book was also published by Bagshawe. This appears to be much more common in the US, so possibly the UK rights for the first book were retained by Davenports preventing Bagshawe from selling the improved edition in the UK. Deveen was a professional magician of his time. He varied his act slightly over his stage career but he had a core skill he stuck to throughout. 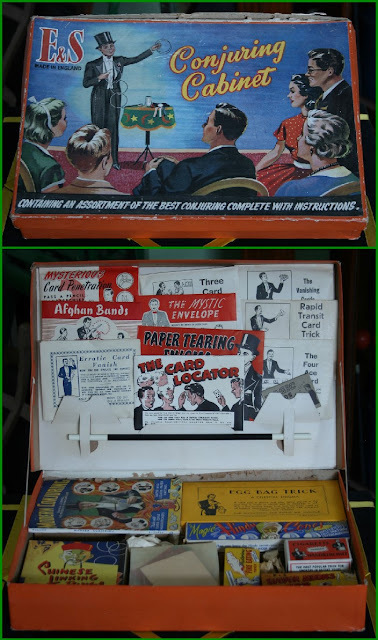 As with many magicians of his era the decline of the music halls cut short his stage career and, though he did appear on television a few times, holiday camps provided a way to continue working as a magician into old age. I think it’s important to include a few notes of Deveen as a person. He’s rarely written about warmly in magic magazines. Even the articles that mention his trip to America focus on his act rather than him. Barbara remembers Deveen as a man of his time. Of course he may have been a different man behind closed doors, but when working he seems to have been rather coldly professional. This may have always been his nature, but it may have been the result of working on an increasingly challenging circuit. We also can’t rule out the impact his wartime experience may have had on his outlook. I hope this rather marathon post has given some context to a magician rarely mentioned today. Thank you again to Barbara Barham, Pete Barham, James Green and John Davenport for their invaluable help with this article.